Ever since I first saw Zdenĕk Mácal, coaxing the jaded New York Philharmonic of 1976 into polished performances of Romantic warhorses, he's been one of my favourite conductors. His career, however, has been the sort that, in those pre-Internet days, was hard to follow from afar: a scattershot discography (CfP, Koss Classics, Delos); a few mid-tier directorships Stateside (Milwaukee, Newark); and a stint with the august Czech Philharmonic, from which he resigned abruptly during his fourth season. As the present concert recording of the Mahler First shows, nearly forty years later, time hasn’t dimmed the veteran conductor's illuminating insights. First of all, Mácal makes a point of clarifying details - of articulation, of counterpoint, of orchestration - frequently taken for granted. In the spacious first-movement introduction, for example, he sees to it that we can hear the third trumpet continuing beneath the woodwinds at 1:43. Similarly, in the Scherzo, the upwardly rushing string chords at 2:58 are brilliant, because Mácal has the second violins and the violas play as energetically as the firsts. In the Finale, you actually hear and feel the string run resolve at 1:07, just before the first subject proper - a resolution usually covered by the punctuating chord. Such expository details could have amounted to so much auditory clutter; here, however, they enhance the musical and emotional richness. As that last comment suggests, Mácal is attuned to the expressive import of each element in the score. Even so simple a phrase as the oboe duet at 1:00 in the first movement suggests a cry of pain, incidentally turning the principal's old-fashioned woolly vibrato to good use. Gently pointed staccatos lend the start of the exposition an easy freshness. As the development begins, the attacks on the woodwind phrases have a real tenderness, the better to set off the precise, quietly ominous entry of the tuba and bass drum at 9:18. The arrival of the horn theme at 11:14 stays transparent, and its return in the recapitulation is both strong and light. In the Finale, the quiet parts of the "development" sections carry a hushed anticipation, while the outpouring of tone and emotion at 14:36 is impressive. Yet, for all his attention to detail, Mácal's forthright musicality ensures that the effect never becomes episodic or fragmented. The first movement receives an unusually unified presentation, though, as suggested earlier, the Czech finds plenty of variety of mood and texture in it. The Trio of the Scherzo is relaxed and elastic, but Mácal keeps the flexibility within reasonable bounds, eschewing the stop-and-go effects of Bernstein (Sony) or Païta (Lodia). Similarly, in the steady, sombre Funeral March, the conductor doesn't overdo the tempo changes for the klezmer episodes, easing gracefully, if unnecessarily, faster for the Nicht schleppen at 2:50. The Finale's opening is particularly strong - Mácal integrates both the driving string runs and the weighty brass interruptions into a single basic pulse - though the conductor does adopt "traditional" adjustments later on: the customary unmarked meno mosso for the soft chorale at 8:05, and an acceleration into the end of the coda. 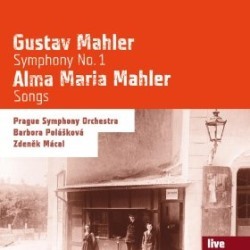 Under Mácal's direction, Prague's "second" orchestra sounds nearly as good as its first. The strings are warm and unified; the opening harmonics suffer a slight whistle, but the attack is clean and the pitch is clear. The runs in the Finale's introduction are crisply articulated. Woodwinds are poised, and horns firm and focused. The brasses in the Finale are full and brilliant. This being a concert recording, there are passing imprecisions - slightly "off" balances, imperfect dovetails between phrases - and a general uncertainty in parts of the Finale suggests flagging attention. None of these, however, do any real damage. Alma Mahler's music has attracted only sporadic interest, so the present selection of songs constitutes a welcome makeweight. The earlier songs, especially, sound comparatively "advanced": Alma flirts with Expressionism as her husband is only beginning to emerge from his "Wunderhorn" period. An undercurrent of unease compromises even the most affirmative passages. The orchestrations, by the Mahler scholars and composers Colin and David Matthews, sound both full and clear. Save in a few details - the soft gong strokes at the close of Licht in der Nacht, for example - they're not particularly "Mahlerian," but, then, there's no reason Alma's music should necessarily sound like Gustav's. Barbora Polašková sings with feeling and warm tone, but the music's tessitura - comparatively high for a “mittlere Singstimme” - taxes her, notably in Waldseligkeit. You probably shouldn't retire the Mahler Firsts of Horenstein (Vox, Unicorn), Solti (Decca. the LSO version), Masur (Teldec, Warner), Levine (RCA) or Mackerras (CfP, worth hunting for). However, it's a pleasure to hear Mácal still on form, and working in home territory; and Alma's songs are worth having.